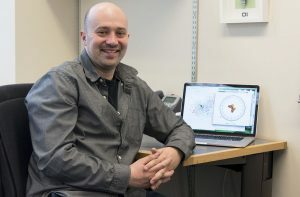 Facebook Research recently recognized the pioneering potential of Electrical Engineering and Applied Mathematics Assistant Professor Eli Shlizerman’s company, Dreambit. Facebook acquired the company to apply the advanced image software to 1.7 billion Facebook users. Shlizerman will split his time between the University of Washington Department of Electrical Engineering (UW EE) and Facebook Research. Shlizerman joins Facebook with UW Assistant Professor of Computer Science and Engineering Ira Kemelmacher-Shlizerman, world expert in faces and 3D modeling. Together they co-founded Dreambit, which is a personalized image search engine. Given one or more photos and a text query, it outputs versions of the input person in the query appearance. Shlizerman brings expertise on neural networks and optimization of dynamical systems to Facebook. His expertise will be applied to applications of neural networks for computational photography, face processing, vision and graphics. The experience he gains at the social networking hub will inform future research developments at UW EE. While at Facebook, Shlizerman will remain as Assistant Professor and keep an active research program and advise students at UW. Shlizerman is an expert in dynamical networks. He studies dynamic mechanisms in neurobiological networks and concepts we can learn from them to design better artificial neural networks.